According to Terry Brown’s book, THORNER, THE MAKING OF A YORKSHIRE VILLAGE, first published in 1991, the Thorner Painting was painted by Frank Percy Wilde in the late 1890’s showing the new light erected at the end of Stead Lane in November 1889. 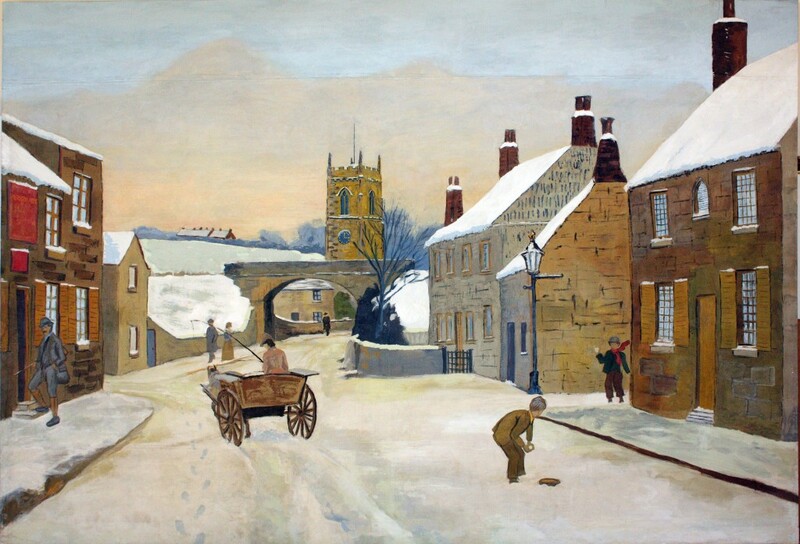 The picture is a snow scene, depicting the old Mexborough Arms, demolished in the 1960’s, Cottages on the Stead Lane side now demolished and the single track railway bridge which was built in 1867 and demolished in 1967. It also depicts local residents, the Vicar (the Rev Whitworth), Gamekeeper, the carrier, and young children. Until recently it was hung in a prominent position in the Victory Hall, and over the years it sustained water damage and tears to the canvas, and also it has been cut down since it was used as backdrop to the stage and nailed to an unsuitable backing. Due to renovations in the Victory Hall it was necessary to take the picture down for safe storage. It became apparent on close examination that the picture was in dire need of urgent, major repair and restoration. This picture has featured prominently in village life as a picture in the Victory Hall, the frontage of Terry Brown’s work of major historical reference and the cover of the historical society calendar of 2009. The Society researched the painter and came to the conclusion that this was executed by Frank Percy Wild born 1861,who was a member of the Royal Academy. Percy as he preferred to be known lived at Bramley Grange, Thorner and painted from 1889 to 1950. To ensure the painting was saved for future prosperity, the Society undertook a programme of fundraising to have the painting professionally restored, reframed and hung in a prominent place in the Victory Hall for villagers and others to enjoy. The restoration was carried out by David Everingham Conservation of Harrogate and Framing was by Frame Abel of Tockwith. Restoration and Framing was completed in 2012 and re-hung in the Victory Hall where it now takes pride of place. Restoration and Framing was completed in 2012 and re-hung in the Victory Hall where it now takes pride of place.